How Are Water and Other Fluids Digested In The Human Body? Water and other fluids follow the same journey as other food articles, but in their case, the process involves absorption, rather than digestion. It’s commonly known that the food we eat goes straight to the stomach through the esophagus (a.k.a. food pipe) after being swallowed in the mouth. We already covered the entire journey of food, starting when it enters the mouth and ending when it’s excreted from the body, in this article. However, we’ve recently had several readers ask us about what happens to water and other fluids, like tea, coffee, alcohol and other beverages that we regularly consume. Do they follow the same route as the ‘solid’ food or do they have a different, quicker route for digestion, primarily because they are liquids? Humans typically consume around 2 liters of dietary water on a daily basis through various means, including drinking water directly or via food and other beverages. Additionally, the volume of gastrointestinal secretions (including gastric, salivary, pancreatic, intestinal and biliary) amounts to around 8 liters, which means that 10 liters of fluids enter the intestines every day (Source). That’s quite a significant amount of fluid to be processed – or more specifically, absorbed – within the body. When talking about digestion/absorption of the stuff that we consume, the first thing you should always keep in mind is that everything we eat goes to the stomach via the same route, i.e., the esophagus. Liquids like water, tea and alcohol do not take a different route. The initial digestion stage is akin to putting your entire meal (liquids included) in a blender. Just as in the blender, everything we consume gets mixed up together and forms a gooey mess inside the stomach. However, just so you know, the breakdown of the food begins before that, when it is inside the mouth itself. Teeth pulverize the food mechanically, while the saliva present in the mouth breaks down fat and starch chemically. This happens for solid foods that contain large complex molecules, such as proteins and carbohydrates. Water, on the other hand, is a very simple molecule, so our body doesn’t have to break it down into smaller, simpler molecules. 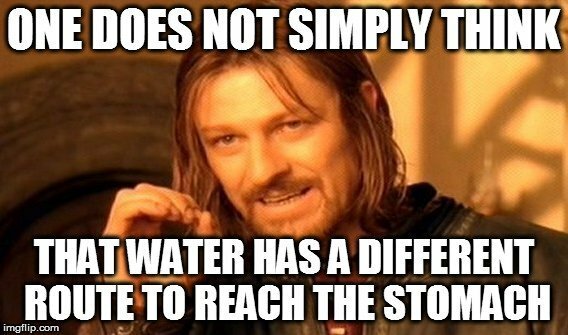 As a matter of fact, water molecules are so small that they have no problem diffusing through the phospholipid bilayer that forms the cell membrane of human tissues. This cell membrane (presumably) consists of small channels or pores through which water or water-soluble substances can enter, meaning that water is directly absorbed through the epithelial cells that cover humans’ intestinal tract. In short, this means that the small intestine is responsible for the absorption of most of the water that we consume. Fortunately for us, the small intestine is up to the task. It’s quite an extensive organ, boasting a length of around 20 feet (6 meters). It also has a huge inner surface area of roughly 250 square meters – the size of a tennis court! (Source). The large surface area helps in the quick and efficient absorption of water and other fluids. The non-water fluids that we usually consume on a daily basis are nothing but chemicals suspended in water. Consider fruit juice, for example. It mostly consists of water and sugar, along with several other ingredients in small quantities. So, it also goes through the same process as the rest of the food, i.e.,. undergoes primary breakdown in the mouth with the help of saliva before moving to the gut. There, it will be broken down further with the help of pancreatic juices and enzymes in the stomach, and will then finally be absorbed in the small intestine. When alcohol (ethanol) is consumed, it first enters the stomach, where it can be absorbed into the bloodstream. If there is food already present in the stomach, the absorption of alcohol into the bloodstream slows down considerably, as it can’t be moved to the small intestine immediately. On the contrary, if one has alcohol on an empty stomach, the absorption of alcohol into the bloodstream takes only a few minutes. All in all, everything that we consume in our diet is broken down to its bare constituent molecules through digestion. Therefore, it doesn’t matter whether you’re having a sumptuous meal or a simple glass of juice; everything is treated more or less the same way after it has been ingested. Thank you Ashish for this most enlightening article, written so simply and clearly for lay people like me. It gives all the answers one could ask. Thanks. It’s the incorrect use of the word gnash. Gnash is to grind ones teeth and not masticating food to mix with saliva as you’ve written.